The pie begins with an all butter crust. I understand that many home cooks prefer to add shortening or butter-flavored Crisco to their pie dough for an extra flaky end result, but after trying it for myself I'm not convinced. Butter yields a crust that is plenty flaky enough, and the flavor is beyond compare. See all those lovely products above? That's nearly all of the ingredients for our pie filling - and all Fair Trade certified! 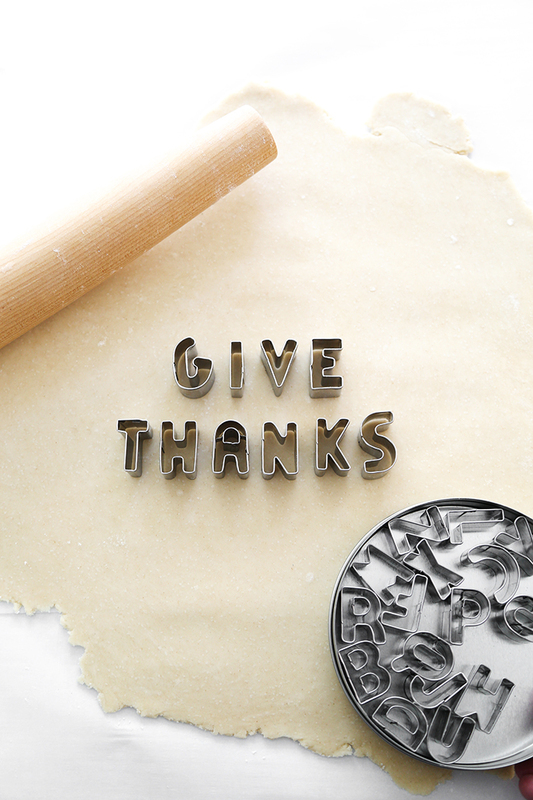 Monday begins Fair Trade's 'Give Thanks' campaign, which aims to extend the spirit of gratitude at the heart of Thanksgiving to the people who helped grow our favorite Thanksgiving products. And let me tell ya, I am extra thankful for that Chuao honeycomb chocolate bar! There's no corn syrup in this recipe, only pure organic honey. Normally I'm wary of using large amounts of honey as an ingredient in desserts because it can be overpowering. In this recipe, a small amount of dark chocolate along with a little espresso powder tempers the honey flavor and transforms it to something new and delicious. 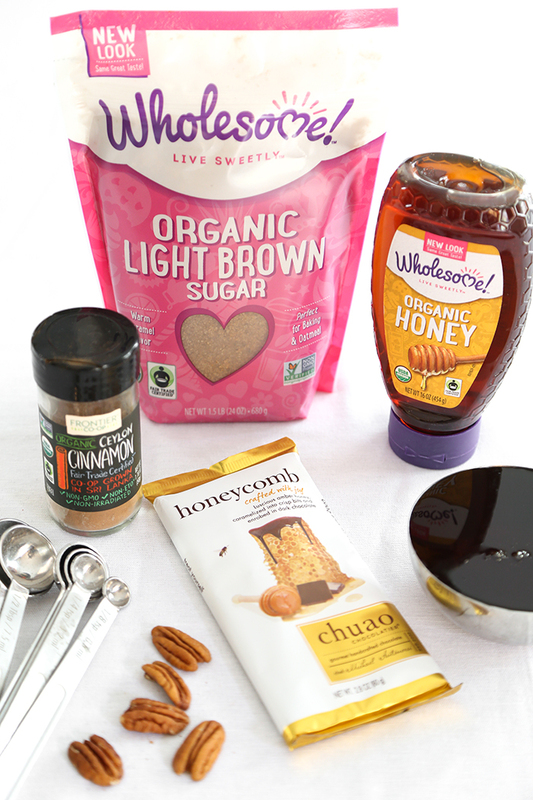 These ingredients deepen the flavor of the honey without calling much attention to themselves. It's nice. I'm excited for you to try it! I used a Chuao honeycomb chocolate bar in this recipe which has little bits of caramelized honey inside. 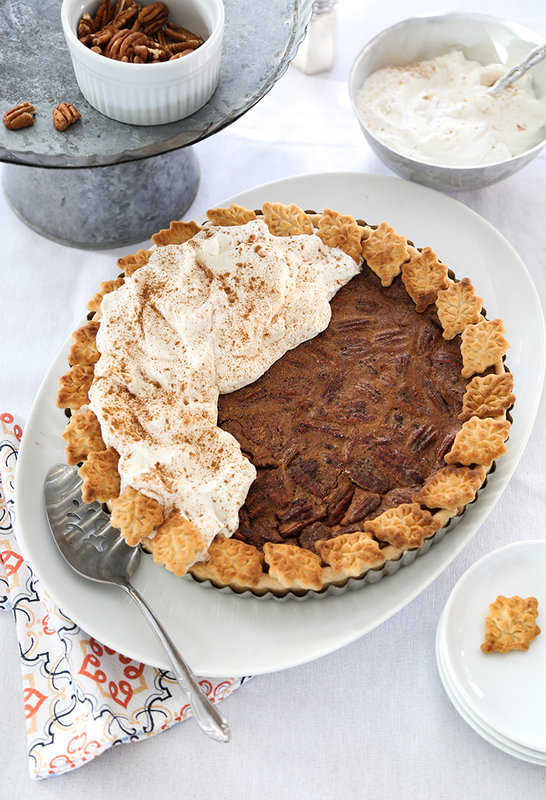 I highly recommend seeking it out for this recipe, but if you can't find honeycomb chocolate then regular dark chocolate is A-OK.
We really enjoyed this pie with a huge dollop of whipped cream on top. 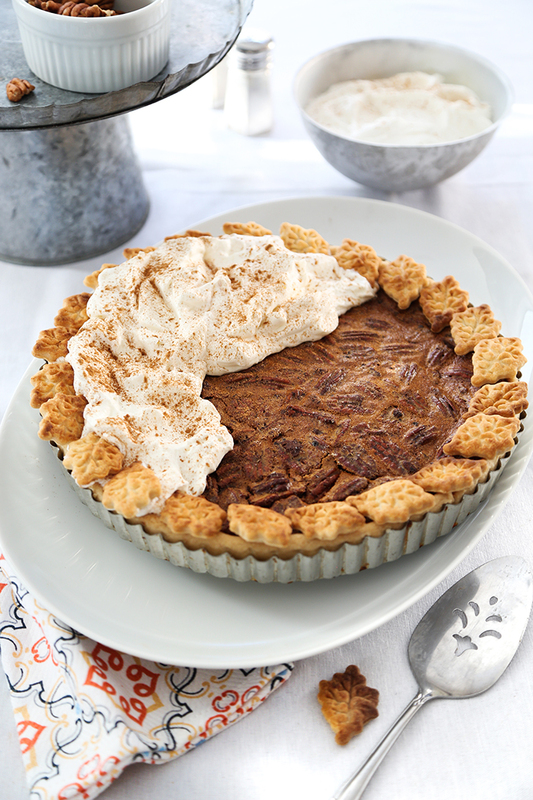 It adds a creamy note to the pie's flavor and many textures- crunchy, chewy, gooey. There's so much to love! 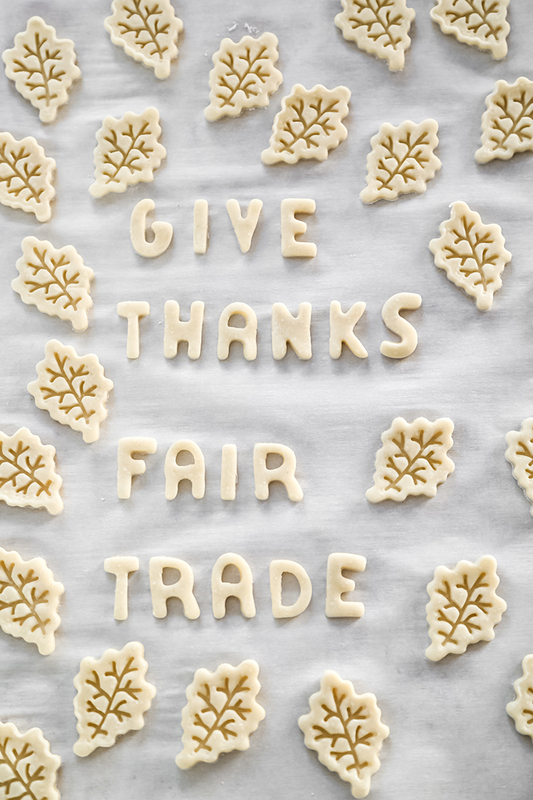 Keep an eye out for Fair Trade's 'Give Thanks' campaign happening this coming Monday the 13th, and discover all kinds of mindful products and ingredients to be thankful for! Special thanks to Wholesome!, Chuao Chocolatier, and Frontier Co-Op for providing the fine ingredients to make this pie. 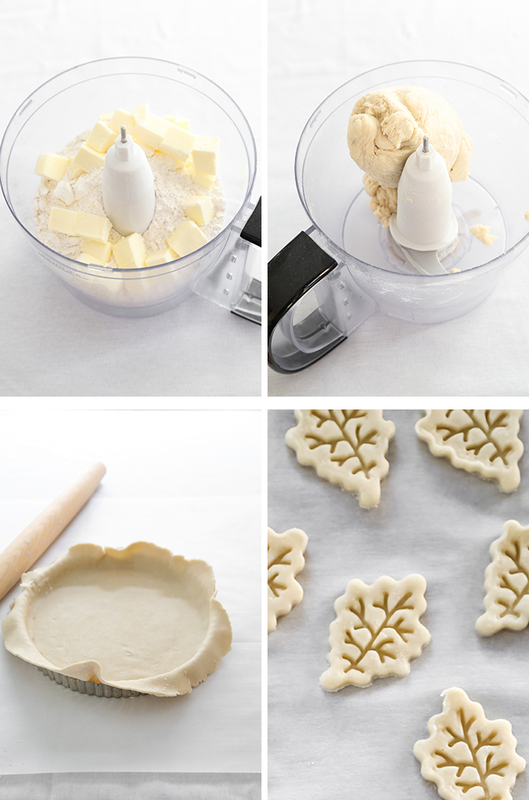 For the pie crust: Place the flour, salt and cubed butter in the bowl of a food processor. Pulse 3-4 times until the butter is distributed and pea-sized pieces are visible. Pulse while adding the ice cold water through the processor’s feeding tube. The dough should come together with several pulses and form a ball to one side of the bowl. Lightly flour a work surface and rolling pin. Roll the pie crust to 12-inches for a 9-inch pie, or 14 inches for an 11-inch tart pan. Fit the dough inside the pan and turn the overhanging dough under; crimp the edges as desired. Refrigerate the pie crust while you prepare the filling. 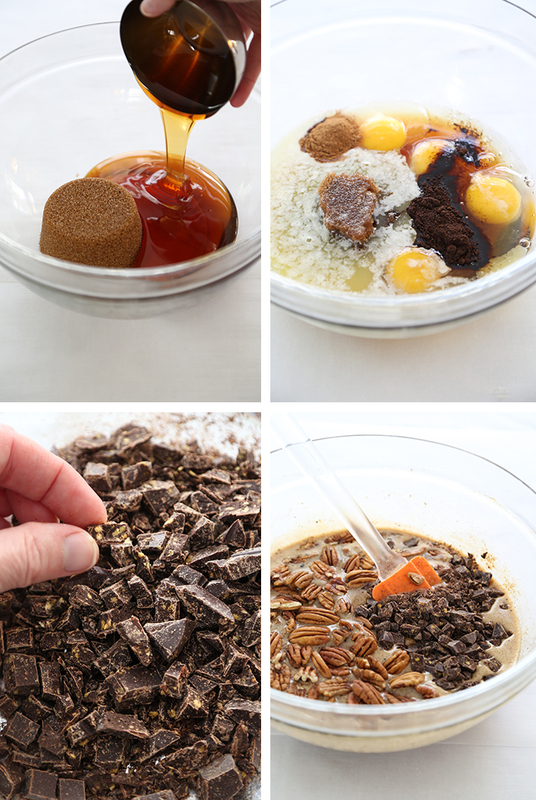 Beat together the eggs, honey, brown sugar, butter, espresso powder and cinnamon in a medium bowl using an electric mixer. Stir in the chopped chocolate and pecans. 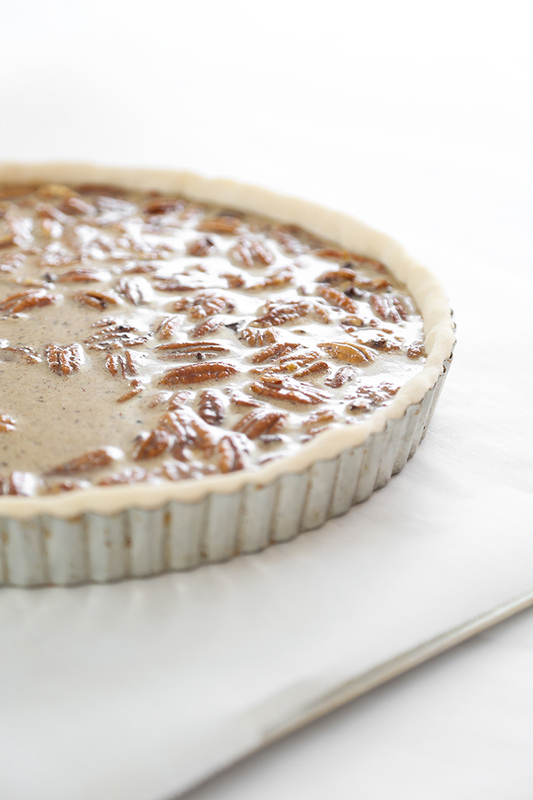 Place the pie crust-lined pan on a baking sheet and carefully pour the pecan filling on top of the crust. Transfer the pan to the oven and bake for 45- 50 minutes until the filling is puffed and set. Insert a knife near the center of the pie; it should come out clean when the pie is done. Cool the pie in the pan on a wire rack. Cover and chill for 2 hours. Serve with whipped cream and a pinch of cinnamon on top. I'm with you - butter all the way! This was delicious. Made it for Thanksgiving. My boyfriend was told that a girl that makes this kind of pie you don't ever break up with. The cinnamon, and espresso balance out the richness of the honey, and chocolate. Regular cinnamon wouldn't have the same effect. Thanks for making me look great.